The DataCal Dari language keyboard labels are a high-quality, durable and economical solution for creating a Dari bilingual keyboard. The Dari keyboard labels are printed on clear Lexan® so the original key legend shows through; this allows you to add Dari labels to your existing keyboard so that it becomes a bilingual keyboard (Dari) and the original language of your keyboard). The labels are available in blue letters on clear labels (for beige and light colored keyboards) and white letters on clear labels (for dark colored keyboards). This keyboard label set is compatible with the Windows 7 and Vista. 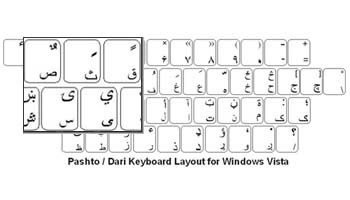 Windows XP, ME, 98 and 95do not have a Dari keyboard layout for the Dari language. Dari labels are a very economical option for creating a bilingual Dari keyboard. The language labels use an easy peel-and-stick method to install. They will not damage the original keyboard key. The letters are printed on the underside of the Dari labels so that the lettering will not wear out. This affords you with many years of durable use. Because Pashto/Dari usesright-to-left text entry, some applications change the location of certain keys,such as the parentheses, brackets, and braces. For example, some applicationsplace the left parentheses on the "9" key while others place it on the"0" key. The Pashto/Dari for Vista labelset includes dual labels to match different software applications. Forexample, you can select the left parentheses to be on the "9" key orthe "0" key. You should check your software tosee which labels match the way it types. When you know how your softwaretypes, you can then select and install the correct label on the "9"key.